In animal welfare, we talk a lot about the important of spaying & neutering. We see the effects of explosive overpopulation – the exponential growth of two dogs to ten to thirty – and the decision to fix is an easy one. But what about the people in our community? What about the average people who don’t see the 4,000 animals we care for at the APA – and instead their connection, deep and real, to animal welfare is through a single animal: their animal. When I joined the APA in March, I was hired as coordinator for our new Pet Partners program. 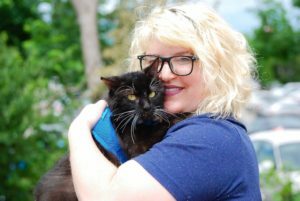 Pet Partners is modeled after the HSUS Pets for Life approach: a radical, compassionate program designed to keep pets in homes, regardless of economic status of families. As part of my job, I would be knocking on the doors of people with limited veterinary resources, folks who may have never stepped foot in a vet’s office. At first, I came with the mindset of a rescuer. I have three years of TNR experience and two of fostering. I know the science of spay and neuter – how it is the only answer for overcrowded shelters. I hit a wall. The overpopulation argument was intangible to these community members. Their dogs, they argued, stayed in their yards. They didn’t plan to breed them. Sure, accidental litters happened, but they’d find homes for those pups. They were responsible and I, a stranger, wanted to take their dogs just in case? No, thanks. It wasn’t until I remembered Kesha that things began to gel. Kesha was my brother’s beloved tan Chihuahua. Full disclosure: this is the kind of story where the dog dies in the end. But stick with me, I think I can make it worth your while. Certain people have the magic touch when it comes to animals. At the APA, dogs instinctively know they can trust our vet tech, Devan. Ferocious felines melt when they encounter Beth. Robert has an ease around birds that frankly baffles me. For strays, my brother has this kind of energy. In 2010, on some busy intersection, my brother found Kesha. She ran immediately to him, bypassing whizzing cars and other would-be rescuers. I did not immediately understand my brother’s fascination with this sad gremlin. She was anxious and odd and round like a sausage. But my brother loved her. He argued that she’d stand no chance at animal control because she was reactive and scared and (by some metrics, although not my brother’s) aesthetically displeasing. There was little denying these arguments, so she became the fourth dog to take up permanent residence at my parent’s ranch house in San Bernardino, CA. And Kesha thrived, or whatever the version of thriving was possible for Kesha. Once, she experimented with the pool, and nearly drowned. Our third dog, a black and sleek Chihuahua, barked incessantly until my father came to investigate. Fully clothed, he jumped in and rescued Kesha. When it became clear that Kesha could not handle dinner time with the other three dogs, my mother fed her separately in the kitchen. She bought her a big, comfy bed. Kesha once ran away for 12 hours. We are unclear how she escaped, but eventually my mother found her in a closet, with a new squeaky toy. Kesha never left again. As she aged, her eyes grew increasingly buggier and her habits more neurotic. Regardless, for seven years she lived there, treated with love and understanding, even if she never quite grew out of her strange shape or personality. In 2017, I got a phone call from my father at 9 am. By now, I was living in the central time zone, doing housing outreach in East St Louis. It was 7 am California time and that meant something was wrong. It was October and the day was still and beautiful. “Kesha is gone,” my dad said. She’d died on the operating table in the middle of the night. The doctors were attempting an emergency save. The cause of death was undetermined but the doctors suspected complications and pyometra: an infection of the uterus. When I called back an hour or so later to speak to my mother, her voice was small with guilt and grief. I imagined her curled up in bed, a quilt pulled up to her chin. My mother is already a tiny person, but this threatened to overwhelm her. I told my mother to be proud of the seven years Kesha had had with my family. Kesha was not an easy dog, but boy was she loved. I called my brother next. He’d moved to Berkeley, CA in the last couple years, working as some kind of complicated salesman selling internet widgets in San Francisco. When he answered, there was no words. Just an unending, gasping, heaving sobbing. He was wailing. My brother was undone. My parents cremated Kesha and spayed the black Chihuahua, Parker. Although we are a family of animal lovers – we’re even vegetarians!—we had simply misunderstood the risks of not spaying and neutering. We were horrified by the overpopulation in the shelters. The reason they kept Kesha in the first place was to keep her out of the notoriously jam packed animal controls in the Inland Empire, CA. From the perspective of overpopulation my parents were responsible, reasonable people. They had a tall fence and none of our dogs ever had puppies. When we’d found a male and a female lab in 2012, we’d paid to have them each neutered before donating $200 to send them to a specialty lab rescue in San Diego. We had no moral hang-ups, we weren’t lazy, we weren’t evil. No one had ever said the word “pyometra” to us before. It is 2018 and I am standing on the front porch of a man named Larry. He is telling me about his beloved dog, Libby. She is a sunny little yorkie and I can immediately tell this dog has never met a stranger. He tells me how she loves car rides and snuggling. He is asking me about grooming and flea preventative and how to keep Libby healthy. I have many of these conversations. I stand on front porches and I tell pet parents about dog STDs, about mammary tumors, about reproductive cancers, and tumors blocking urinary tracts. I tell them about pyometra. I do not talk about overcrowding. Larry considers my arguments. At first he is unsure, but eventually he agrees to let me spay Libby on June 22nd, 2018. Her surgery is a success, although the doctors find something unusual (although by no means rare): pyometra. Libby is sent home with two extra antibiotics, both paid for by the APA Pet Partners program. Libby is expected to have no further complications from her pyometra. She is expected to live a full and healthy life. She is, as Kesha was, seven years old. If our goal, as animal welfare advocates and rescuers, is to save more lives: we must shift our perspectives. Spaying and neutering has indirect effects on lives: it certainly contributes to overpopulation. But if you are looking for an argument that will help the pet in front of you – and sway the family of that pet – focus on health.